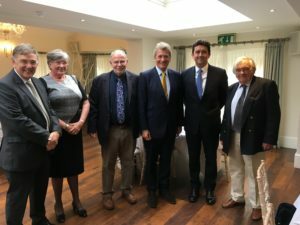 Family businesses need to marry tradition with ambition in order to survive, according to Everards managing director, Stephen Gould, who spoke at the Rutland Biz Club at The Falcon Hotel, Uppingham on Friday 21 September. Stephen outlined the success of the family owned brewery that was founded almost 170 years ago by entrepreneur and farmer, William Everard in Southgate Street, Leicester. Its beer is now served in more than 175 pubs across the East Midlands. Attendees heard about Everards exciting new ventures including a move from their base at Castle Acres, Fosse Park, to new offices set in 72 adjacent acres of green space at Everards Meadows. It will include a beer hall, café and a 10,000 sq ft cycle centre built in partnership with Rutland Cycling. Leisure activities will see cycling and pedestrian walkways linking to the national cycle network Sustrans and Leicester City Centre. Biz Club President Geoffrey Pointon said: “Stephen’s speech really had the wow factor. His innovative and long-sighted business acumen highlights the need to spot new trends and to keep moving forward and innovate to survive”.